ALPHA CHECKWEIGHERS, a division of the ALL-FILL CORPORATION, has been building precision, dynamic checkweighers since 1987. As an acknowledged North American leader in the design and fabrication of precision weighing instruments, ALPHA has become the standard for many food and pharmaceutical based manufacturers that are looking for cost effective and reliable equipment to provide the highest level of product quality and overall cost control. With an extensive range of platforms, ALPHA offers the utmost in versatility when it comes to weighing a wide variety of package types and configurations, no matter what your environment. Integration with a range of metal detection options is becoming a common approach to achieving product compliance and safety in the smallest space possible. 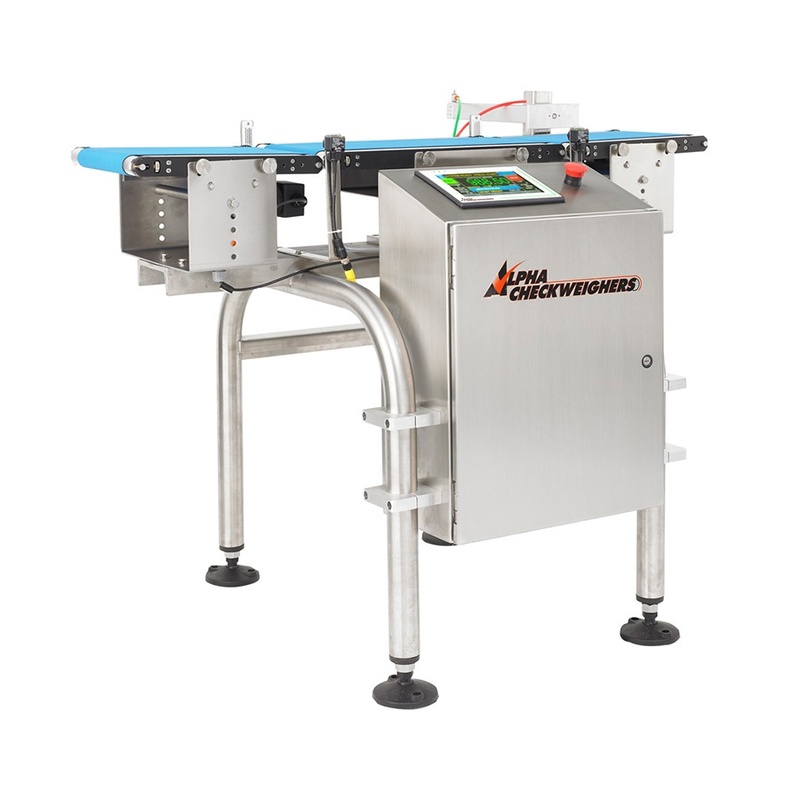 The Model EW-8 is Alpha Checkweigher’s economical solution for users and applications that may be new or unfamiliar with the advantages of checkweighing on new or existing filling, feeding, inspection, or other packaging lines. Based on the field-proven line of Alpha Checkweighers, the EW-8 offers the same versatility and reliability as other Alpha models. The EW-8 consists of a sturdy, tubular frame with a 5” U-channel main support plate that serves as a mounting location for the three belt-driven conveyors and the digital strain gage loadcell. A slope front control console houses the electronics and the color touch screen Human Machine Interface (HMI.) Reject options include Air Blast, Pusher, or Bopper to remove unacceptable weight packages from production. The EW-8 is operated and controlled from a series of full color, easy to read and use screens on the front mounted touch screen panel. Dedicated screens are provided for all major functions and operations for testing, set up, calibrating, and operating the checkweigher. Useful short term and batch statistics come standard with the CEREBUS IV controlled PW-12. Individual weight or production statistic can be exported via RS-232 or other communication devices. The Alpha HP Series offers several standard features including electromagnetic force compensation weighing technology and an air blast or pusher reject device. The Alpha HP-14 is ideal for accurately weighing packages and containers of up to 4 lbs, 12 inches in length, and 8 inches in width. They can operate at speeds of up to 300 packages per minute with an accuracy of +/- 0.100 grams. Pouches, bags, and other unsupported or irregularly shaped packages pose a problem to conventional checkweighers that use chains or bands as a conveying medium. Not so to the Alpha HP-14, whose weigh table is rigidly constructed and whose weigh table belt, pulleys, and gearhead drive motor are all balanced to ensure accurate, reliable weighing of flexible packages. A continuous, programmable variable speed conveyor provides constant torque. All weighing operations are controlled by the CW700 checkweighing systems, which is easy to integrate with date networks. The system features a user-friendly, graphical touch screen and a structured menu and selection designs for all operating functions. Up to 25 different set-ups can be entered for each size, weight, container, or package. There are no confusing programming steps when changing products, sizes, or weights. An exclusive automatic calibration feature determines all relevant operating parameters for optimum accuracy and checkweighing efficiency. For at-a-glance updates, the Alpha HP-14 features a large character weight display and easy-to-see tower lights. 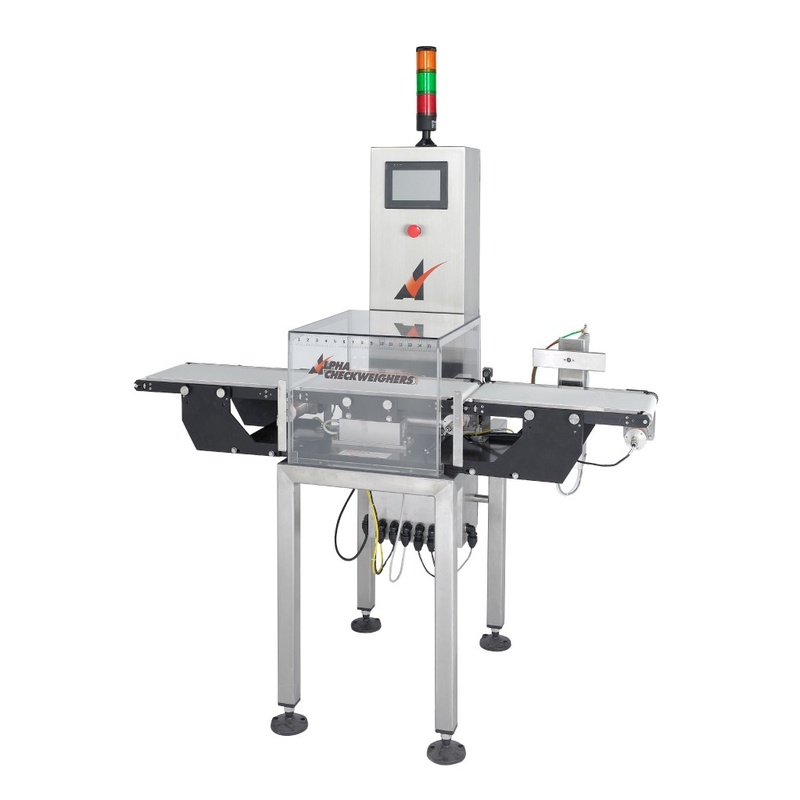 The CW-10 model Checkweigher is Alpha’s solution for fast, accurate checkweighing applications. Its simplified, modular design offers the ruggedness and durability for demanding production environments at significant savings, with no compromise in accuracy or weighing reliability. The Model CW-10’s 12 lb. weighing capacity and line speeds of up to 350 units per minute make it the ideal unit for smaller boxes, bottles, cans, or cartons used in prepared & packaged foods, pharmaceuticals, and chemical products. 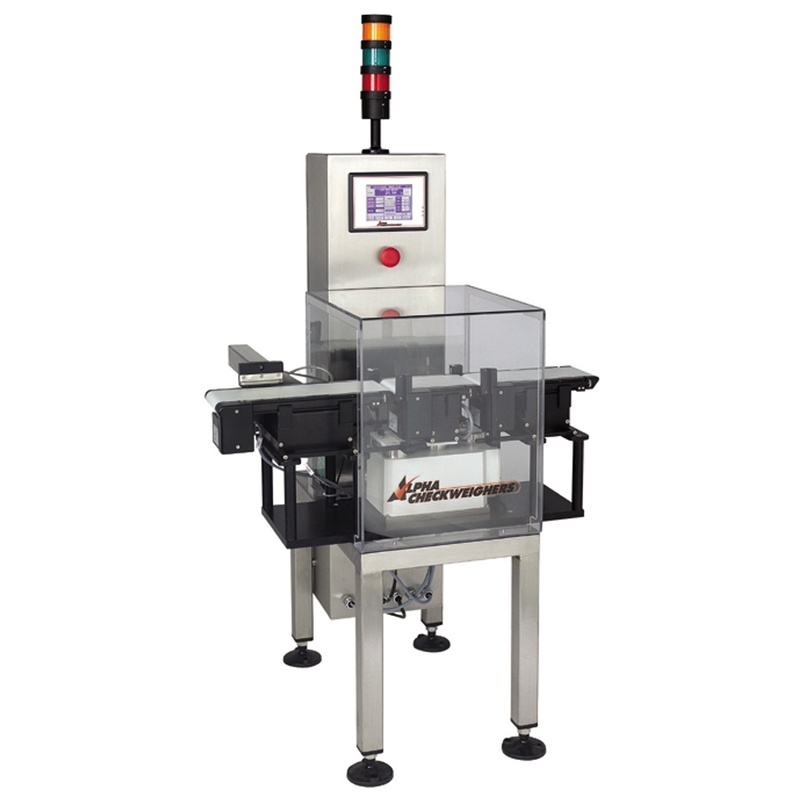 The totally re-designed Alpha Model MW-16 Checkweigher is designed for fast, accurate weight control of cases, bulk bagged products, corrugated boxes, or other medium weight containers ranging up to 35 lbs. (16 kg.). The New Model MW-16 consists of a versatile strain gage loadcell, CEREBUS IV controls with touch screen operator interface, and a rugged Stainless Steel frame. A continuous conveyor belt moves packages across the scale for consistent and accurate weighing. Useful short term and batch statistics come standard with the CEREBUS IV controlled MW-16. Individual weight or production statistic can be exported via RS-232 or other communication devices. The MW-16 can be supplied with optional in-feed and/or discharge conveyors to accommodate both new and existing production lines. A variety of reject devices are available to remove unacceptable packs from the line. 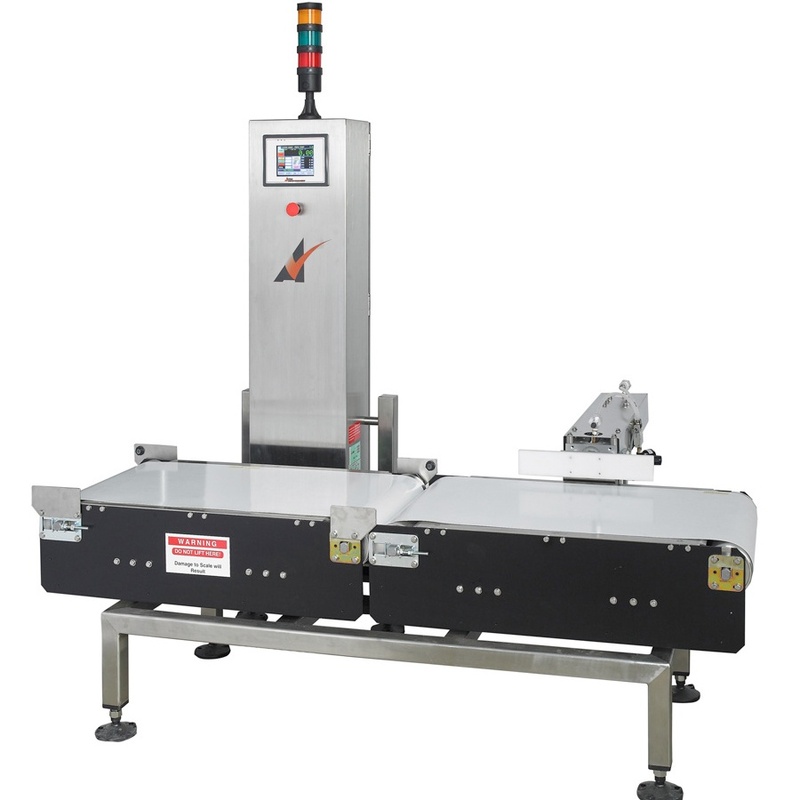 The Alpha Model HW-15 Checkweigher is designed for fast, accurate weight control of cases, bulk bagged products, corrugated boxes, or other large, heavy containers. It consists of a versatile strain gauge weightable system mounted on a sturdy, welded, all-steel frame. 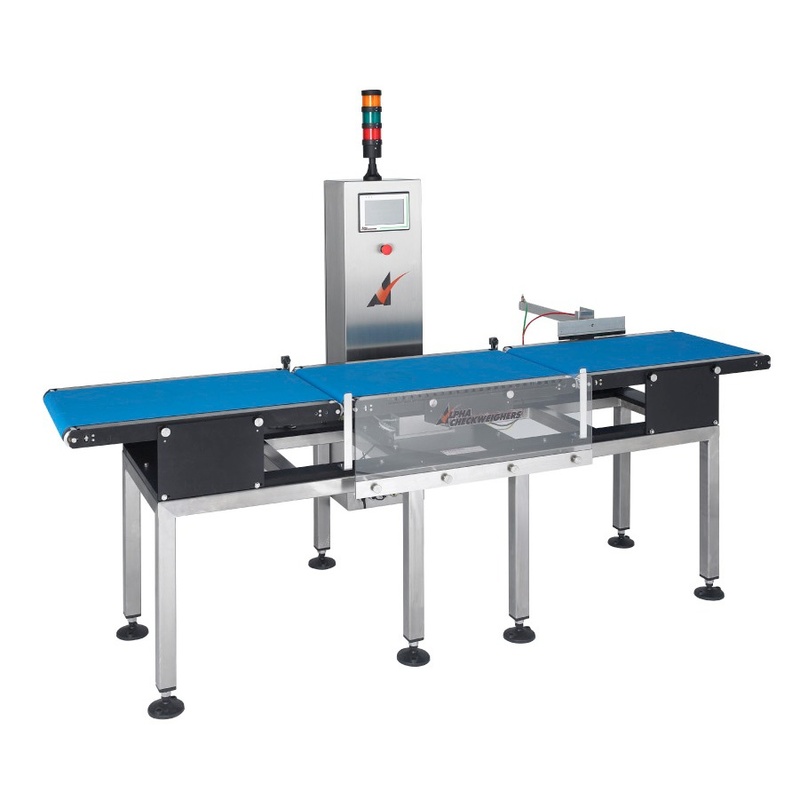 A continuous, non-conveyor belt moves packages for instant weighing. The solid, extruded polyester resin, smooth finish belt wears better, cleans up faster, and lasts longer. 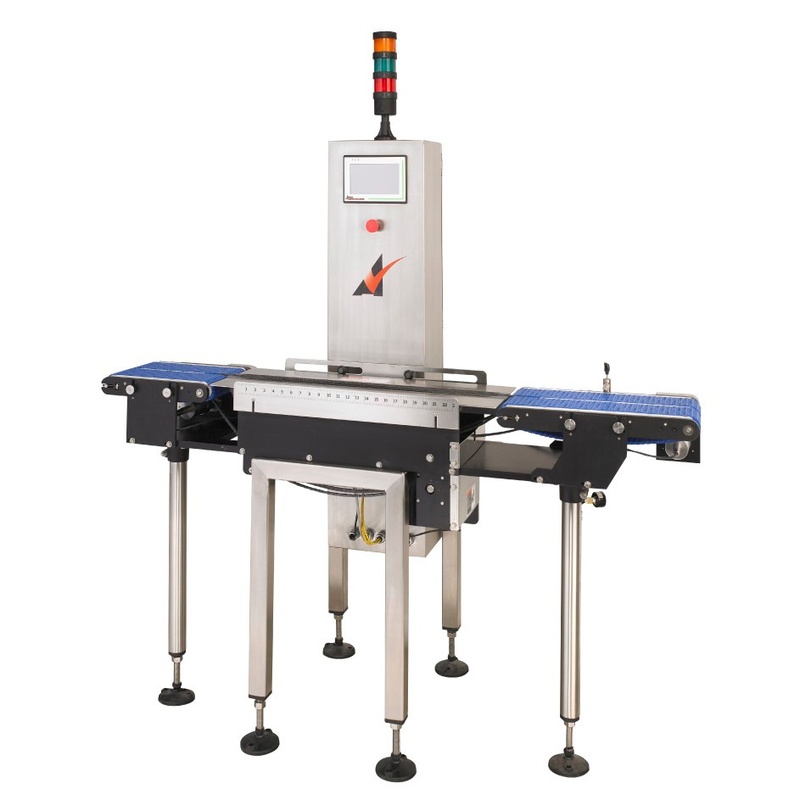 The innovative drive system used in the Model HW-15 provides an efficient, low noise method of transporting packages over the weighing area of the checkweigher. Motor, gearbox, and bearings are sealed within the shell of the roller operating in a continuous oil bath. Separate drive and components, such as chains, drive belts, idlers, couplings, and pulleys are eliminated. Maintenance and servicing is limited to replacing lubrication oil every 10,000 hours of service (up to 5 years). Since nothing rotates except the drive roller, the possibility of injuries and accidents is reduced. The HW-15 can be supplied with optional in-feed and/or discharge conveyors to accommodate both new and existing production lines. Reject devices are also available as options to remove unacceptable packs from the line.